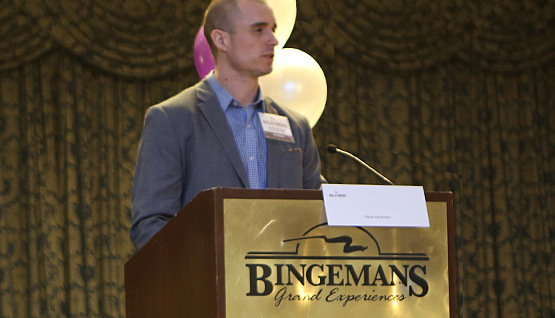 On April 2, 2019, EllisDon Project Manager Ashley Maxwell, MEng was a featured speaker at Build a Dream Kitchener-Waterloo. We strongly believe that closing the gender gap in all industries requires men and women at the table and we asked Ashley if we could share his insight on our blog. His speech from the evening is below. Good evening, my name is Ashley Maxwell and I am a civil engineer and project manager for EllisDon. We are one of Canada’s largest construction managers and can build anything you can imagine. From universities to hospitals and sports stadiums to museums, we build some really cool stuff. My father is a civil engineer and he introduced me to the construction industry early in life; my toys were construction vehicles, I was regularly encouraged to “go out and play”, get dirty, and build LEGO. I grew up playing rugby with other males, most of my closest friends are males, and I went to an engineering school where 28 out of 30 of my classmates were male. It’s fair to say it’s likely the environment I grew up in was different to yours and it was an easy and natural choice for me to enter the construction industry. As I write this I also realized my sibling is male…his name is Daniel and he is also a civil engineer! Fast forward to one year ago, when EllisDon turned their focus to creating a diverse and inclusive workplace. I started to educate myself on the issues that women face. I wanted to dispel the myths of what a stereotypical male construction professional is and that the industry wasn’t full of the poor behaviours it has become known for. It’s been a journey for me personally; I have learned a lot and we have work to do. To the Build a Dream team and volunteers: thank you for paving the way to a better future and letting us be part of the journey. Please continue your work on the movement because you have the power to make this world a better, more inclusive place to live. To the speakers and panelists: thank you for having the courage to work towards your dreams even when the odds were stacked against you. Please continue to inspire, share your story, and allow these young ladies to see a version of their future self. To the partners, sponsors and exhibitors in the room: thank you for leading the way. Please continue to work towards transforming your company and your industry for the better. To the parents, guardians and anyone else who is here in support: thank you for challenging these young ladies to take a risk and be whoever they want to be. Please continue to keep an open mind and guide your daughters to find a place of work that they love, as my father did for me. So what have I learned in the last year educating myself on diversity and inclusion in our industry? I learned that as a white male brought up in the environment that I was means that my workplace looks very different to me than it does to a female. That needs to change if we are going to attract more female talent to our industry. I learned that I wanted to show young women how fun, exciting, challenging and rewarding a career in STEM can be. Finally, most importantly of all, I learned what I already knew at the start of this journey, that having a diverse and inclusive workplace is just the right thing to do. Everyone in our industry is starting to see it from the trades people at the site level to senior management. I for one am really excited to see where it’s going to take us. Thank you, enjoy your night. Build a Dream is designed to attract, encourage and recruit female students to pursue careers in skilled trades, STEM (Science, Technology, Engineering and Mathematics), emergency response and entrepreneurship.